I am the Professor of Paediatrics at the University of Newcastle and a Senior Staff Specialist in Paediatric Respiratory Medicine and Sleep Medicine at the John Hunter Children’s Hospital. I am director of the Priority Research Centre GrowUpWell™ at the University of Newcastle in partnership with HMRI and Kaleidoscope. Our vision is to see an Australia where children grow up healthy, safe and well. Bronchiolitis is a virus infection of the small airways and the most common cause of hospital admissions in babies. It is a strong risk factor for the development of asthma in infants with asthmatic parents. We have identified the world-first prevention for bronchiolitis in infants born to mothers with asthma. Asthma is the most common chronic disease in childhood and can be dangerous if uncontrolled. We have identified the factors that drive the inflammation that underpins the development of asthma symptoms and work on the development of drugs that target those factors. Food allergy is an increasing problem and there is no cure available. It is important to know how severe the allergy is because anaphylaxis can occur. We have identified a blood marker for peanut anaphylaxis, which we are currently validating in a large clinical study. Eosinophilic oesophagitis is an inflammatory condition of the gullet. Our research searches for the key factors which are activated in eosinophilic oesophagitis and modulates them to find better treatments. Non-coding RNA molecules are involved in controlling how our genetic information is used to produce proteins which sustain the function of our body cells. We were the first to prove that inhibiting some of these molecules can be inhibited in the lung to ameliorate allergy and inflammation in the lung. We have seen enormous advances in knowledge how diseases develop and progress. The challenge is now however to develop those discoveries into benefits that really matter to children. This is exactly what we at HMRI work on very successfully in collaboration with our community. Professor Joerg Mattes is the Chair of Paediatrics and Child Health at the University of Newcastle, course coordinator for the Women, Children and Adolescent course in the Joint Medical program (MD) at the University of Newcastle and Clinical Director of the Paediatric Lung Function Service in the Northern NSW Child Health Network (Kaleidoscope). Professor Mattes’ research looks at understanding how asthma, allergies and respiratory infections develop and how to prevent them from occurring in early life. As a trained clinician and basic science and clinical researcher, Professor Mattes believes that excellence in research and education promotes self-improving health care. Professor Mattes was trained as a physician at the University Children's Hospital in Freiburg, Germany, from 1996 to 2005 which included a Research Fellowship at the John Curtin School of Medical Research, Australian National University Canberra from 1999 to 2001. 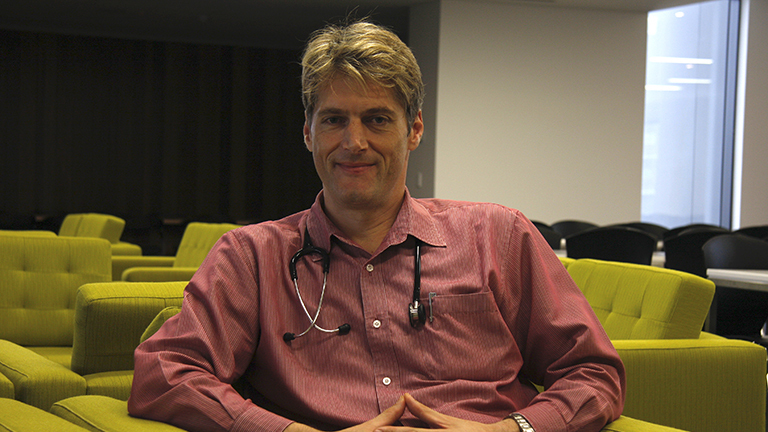 In 2005, Professor Mattes earned a premier Research higher Degree doctorate qualification in Germany in Paediatric Immunology and Respiratory medicine and shortly after settled in Newcastle working as a Consultant in Paediatric Respiratory and Sleep Medicine across the entire Northern NSW Child Health Network but based at the John Hunter Children’s Hospital. Professor Mattes has published more than 100 peer-reviewed research articles in top ranking journals and has brought in over $10 million in grant funding in the past 10 years. Using state-of-the-art experimental disease models, advanced laboratory and molecular techniques as well as infant and preschooler lung function testing, Professor Mattes is at the cutting edge of research into asthma during pregnancy and early life, allergies including peanut allergies in children and genetic susceptibility and regulation of infection and inflammation in the airways.